Share the post "3 Days to Green Movement Challenge with Evolution Fresh"
Juicing has gained popularity over the past few years because of the wealth of health benefits that are associated with drinking green juices on a daily basis. Some of the ways that green juices boost your health and overall appearance is glowing skin, healthy hair, boundless energy, weight loss, and strengthening your immune system. It’s also one of the quickest and tastiest ways to get the vitamins and minerals that your body need in order to function properly, especially if you don’t eat the require amount of fruits and vegetables everyday. The only drawbacks of juicing is that it can be messy and time consuming. It can also be expensive if you don’t grow your own fruits and vegetables. Buying a high quality juicer like the Tribest Slowstar or Omega VSJ843RS can yield the best results, but they normally come with a steep price tag. Those are mainly the reasons why many people abandon ship once they realize the expense, time, and clean-up that goes into juicing at home. Juice companies like Evolution Fresh cut out all of the time and work that goes into juicing that’s convenient for people who lead a busy lifestyle. This January, they challenged me to participate in the 3 Days to Green Movement by drinking one green juice a day for three days. This green movement is to encourage people to take small steps in bettering themselves by drinking healthier beverages. Their greenest juices, such as the Smooth Greens, Sweet Greens and Lemon, Essential Greens with Lime, and Organic Sweet Greens and Ginger, boast more than one pound of green vegetables and 10g of sugar or less per serving in a selection. No preservatives, artificial flavors, or sweeteners are added either. It’s simply pure, natural goodness in every bottle! I’m happy to say that I haven’t drunk an unhealthy beverage (i.e. soda or sugary juices) in YEARS, therefore participating in this challenge wasn’t really a challenge for me, to say the least. But, this was my first time ever trying out Evolution Fresh (Essential Greens with Lime and Sweet Greens and Lemon). It was my favorite way to start my mornings since I was getting a boost of nutrients, vitamins, and natural energy that I needed to jump start my day. I found each flavor to be light, but fulfilling – perfect for a pre or post workout! New Year, New You: Develop a healthy dietary habit by participating in the #3DaystoGreen Movement Challenge with Evolution Fresh by heading to your local Evolution Fresh (limited locations), Starbucks, or grocery store. Also, visit http://www.evolutionfresh.com/3DaysToGreen between now and February 28th to have a chance to win 1 of 25 prize packages that can turn your healthy habit into a lifestyle. Boost your odds of winning entering up to 3 UPC codes. Each UPC code gets you 20 additional entries! Disclaimer: I’m participating in the Evolution Fresh blogger campaign and received compensation as part of the program. This sounds great! I’m always making green smoothies. They make me feel so good! These sound great. I’m trying to eat healthier myself and these could really help. I actually usually just drink water so I’m pretty good on the drinking healthy part. Although these drinks look like they would help me get all my daily greens in! I’ve seen this brand a lot lately and haven’t tried them yet – I really want to! I love healthy juices. These sound great! I’m not big into smoothies or green drinks but my husband is! I generally drink water but I need something new in my life! I started to juice about 2 weeks ago. I did not know this existed, so i am going to seek it out and see how to get these. These sound like a wonderful way to introduce yourself to greens! I don’t mind them in smoothies and even my kids will drink them that way. I can’t bring myself to drink anything that is actually the color green. I am all for healthy choices, but not if they are green lol. I have been hearing a lot about this brand lately. I might have to pick some up and give it a try. I love juicing but I seriously haven’t done it in months! I need to get back into it. It’s good to know there’s Evolution Fresh for those days I don’t feel like using my juicer :). Thanks for sharing! I’ve always wanted to drink more green juices. I’ve never seen this brand before, but I think I’m going to have to hunt it down! I love green juices and the way they make me feel! I’ll have to scope out this brand. Kimberly Morgan recently posted..Happy Spring – Free Printable Art! I’ve been meaning to try out a green juice like this one. Everyone says they’re so good for you, and taste good too. I really want to try juicing. Hmmm I’m just not sure I’ll be disciplined enough! I am going to have to look for these in the store. I usually make my own juices, green and otherwise… but it takes a lot of chopping and clean up after wards. These sound delicious. I’ve been wanting to try juicing this year. I need a better blender though. I just did a cleanse not to long ago, I need to check this out. I’m trying to get these pounds off before summer. I do make smoothies and want to put some green in there but I’m intimidated by it. This might be a better way to incorporate it! Thanks for sharing this brand! I used to drink a lot of green juices, and would like to get back to that when the time is right. I’m still nursing my 1 year old though, so I don’t want to make too many dietary changes until she’s weaned. I need to be healthier. I am definitely going to have to give this a try. Thank you so much for sharing this company. I’ve been trying to live healthier by eating and drinking healthier food and beverages. 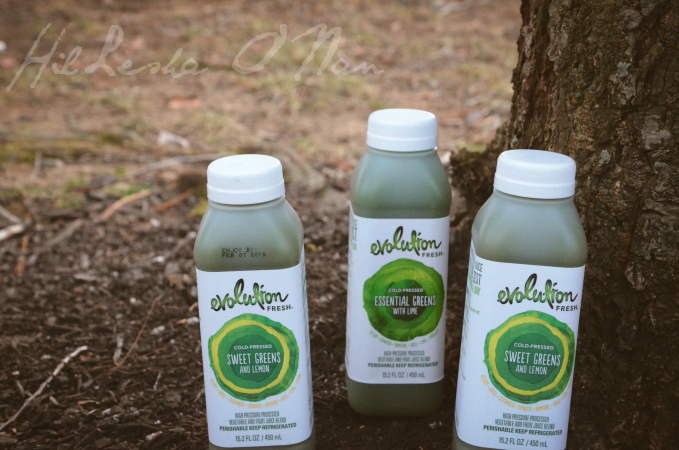 I love evolution fresh – their orange drink is amazing! I’ll to give that flavor a try sometime! Juicing does take a long time! And it’s hard to get the flavor just right too! I’d try these. I know, I know! Thankfully, companies like this exist. I really should try this. I always struggle with what to drink and end up taking some sugary things since I’m not a water fan. This would be so much better for me! This would be a great product for me to try. I have just started experimenting with green smoothies. I’ve just recently started making green smoothies and love them, but making them is a bit time-consuming at times. Having them already pre-made would be nice. I have always wanted to try juicing. I love that I can have something ready to go for me. My friend is all about juicing. I’d love to try it! At least for a pick me up drink for afternoon energy. I love to juice and this is such a great brand. I just tried them and they taste great. I love the idea of the three-days-to-green challenge. People can do anything for three days, so there’s a higher likelihood they will stick to it. In the process, they may just discover they love this stuff! I started juicing a little over a year ago. I love it. Evolution would be perfect to keep in the fridge for those morning that I’m rushing out of the house and can’t juice. The 3 day to green movement is totally doable! Marielle Altenor recently posted..Buying Glasses Online. Like A Boss! I would love to give this a try sometime. I really need to decide what I want to do and start eating better. This looks like something we may give a try. We have not tried too many juices in the past but have vowed for a healthy year! One of my goals for 2015 is definitely eating better and being more mindful of what I consume… for benefits and calories. I would love to try this out. We have tried many different Evolution Fresh juices and really enjoyed them all. My personal favorite is the Pineapple Coconut water.